Hudson & Bryce are brothers whose birthdays fall one year and 10 days apart. Since they share the same friends, and their birthdays fall during the summer when everyone is busy, it makes most sense to create a shared celebration. The boys turning 5 & 4 was the inspiration in creating a space themed birthday party. It's perfect in creating a countdown...5 4 321 Blastoff! After a trip to the planetarium, a lunar lunch was served at a nearby restaurant. 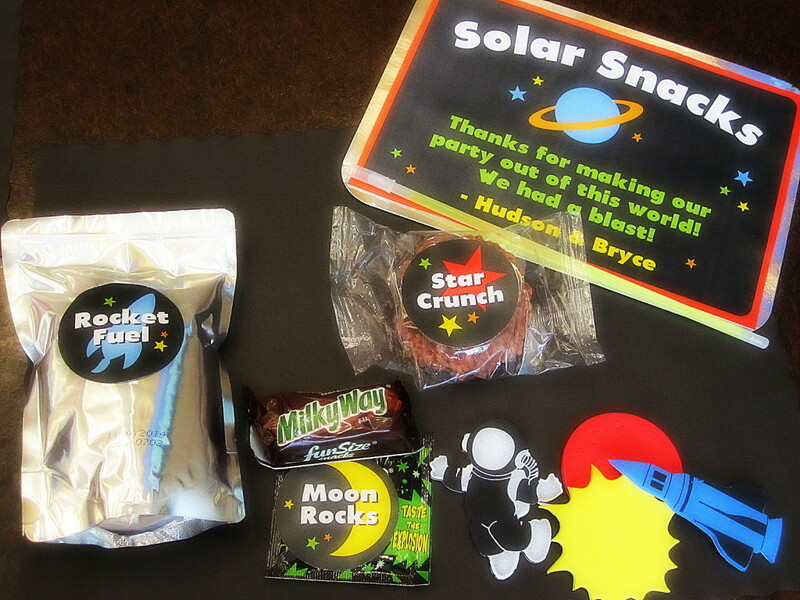 All printables such as the masks, menus, Solar Snacks sign and labels were designed by Artsy Lydia on ETSY. The large photo backdrops of the boys are my favorite design element. They are very inexpensive to print at Staples and add a personal touch. The donut "cakes" were also a favorite because the kids (and adults) were all so excited for a different treat. You are so talented and create the best parties! I fell in love with Par-Tee last year and I can see you had another hit with Blastoff! I absolutely love your space birthday theme and I will be doing that for my 4 year old next month. Could you tell me what you used for the straps of the rocket ships on the back of their seats? We would love to make that for all of the kids to take home. I would love to incorporate some of these great ideas into our VBS 2017 Galactic Starvegyors. The rocket packs are adorable. Are there instructions to create them? hello! i’m so sorry i did not see these comments sooner. for some reason i do not receive email notifications when they are made. for the rocket packs, i just spray painted two 2L pop bottles silver. i used regular duct tape on the back side’s center to hold them together as well as a little hot glue in between. i also used duct tape for the straps. just stuck 2 sticky sides together to make them a little sturdy and taped them to the bottles. tissue paper was the finishing touch for the flames.